The mobula ray looks like a kite with a widely spread body like mat and a lean tail. This will jump to a height and fall down in sea and looks very special. If seen from distance while jumping, this looks like a small aero plane. The shape is also like an aero plane. These Mobula rays are seen more in sea shores of Mexico and California. So many tourists will gather in sea shores to see them. 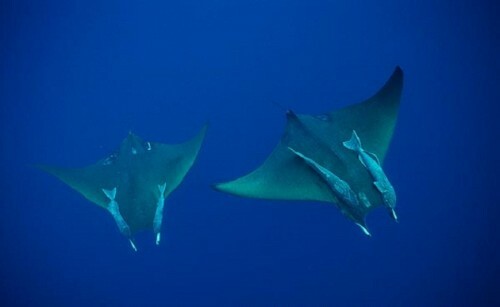 They enjoy in taking photographs while the Mobula rays are flying. Flying doesn’t mean that they fly like birds for thousands of kilometers. It’s only jumping. These will suddenly fly for two meters height and fall down again in sea. At that time they take their gills closer and look exactly like a bird. It is not known know why these are jumping very often. Some scientists say that these will jump when they are happy and some says this is a process in catching the food for them. It was assumed that the parasites that are there on the body will fall down in jumping and these will eat the fishes that came to eat the parasites. These will stay as groups in sea shores and at that time the whole place looks like a blue blanket. The size of these Mobula rays is ten feet height and 17 feet width. These will grow to a weight of one ton. In the ray family after the Manta ray these are the biggest species. These are big in size but they eat crestascenes and crills fishes that look like prawns. These creatures are in the danger of extinction now. Fishermen are catching them when they are in groups at sea shore. Mexican government is punishing those who catch Mobula rays and there is also a fine of $ 10,000.